Photographs of vehicles in Travel Coventry livery. A look at Coventry's most frequent route. Travel West Midlands reference page. Some facts about the company. Enthusiast pages about Travel Coventry (now known as National Express Coventry), the principal bus company in the city of Coventry. Travel Coventry are a subdivision of Travel West Midlands, the principal bus company in the city of Birmingham and a number of other surrounding towns. These pages have information based mainly around operations in 2000-2003. Travel Coventry took delivery of a further 9 Dennis Tridents with Alexander ALX400 bodywork in December 2002. 4404 is seen on route 12 on 3rd January 2003. 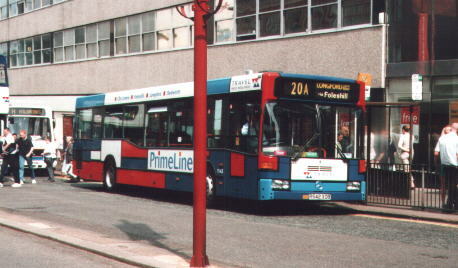 This is Mercedes Benz low floor integral 1542 in Coventry on 14 June 2001. It wears Primeline livery for a quality bus partnership with competitor Stagecoach in Warwickshire and the passenger executive Centro.